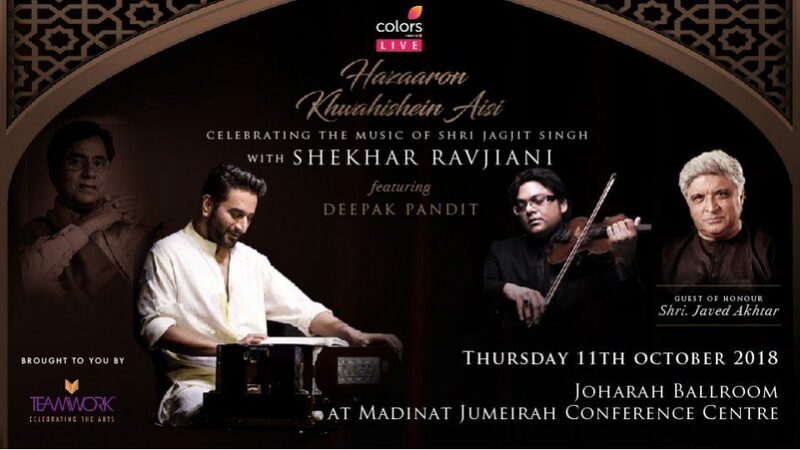 One of the most celebrated names in Indian music, singer and music composer Shekhar Ravjiani will visit Dubai for the first time 11th October with a magical performance «Hazaaron Khwahishein Aisi…». «Hazaaron Khwahishein Aisi» is a nostalgic showcase featuring a rich legacy of music from the most accomplished Ghazal singer and composer of all time. Shekhar Ravjiani is the Indian music industry’s foremost singer and composer. His own songs have swayed millions of hearts around the world over the past 20 years. He has composed highly successful soundtracks for over 65 famous films. He has also sung several very popular tracks. The show will also feature Deepak Pandit, one of the most sought after violinists in India. He has collaborated and performed with some great names in the indian music industry and composed music for several films. The show in Dubai also has renowned lyricist and poet Javed Akhtar who had a close association with Jagjit Singh and will recite some of his poetry. Guests attending the show are encouraged to dress in white and gold to reflect the majesty of the musical journey that they will experience.